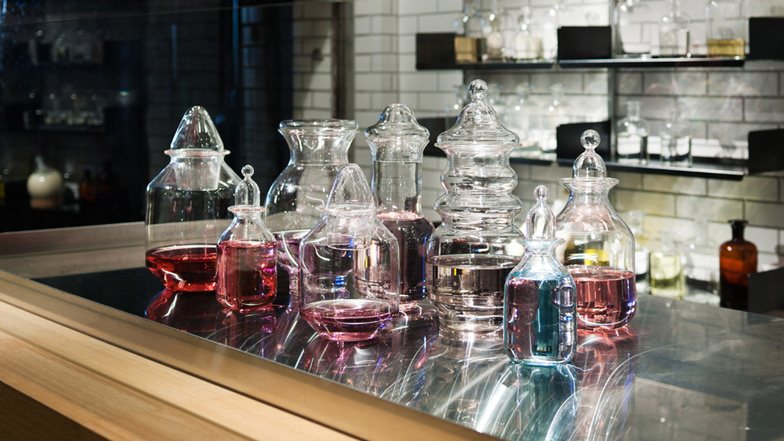 Japanese designer Yusuke Seki and Spanish designer Jaime Hayón have designed a sweet shop in Yokohama where colourful liquids are displayed inside glass decanters, ready to be made into confectionary before customers' eyes. Seki designed the interior of the Papabubble store, while Hayón designed the glass containers, utensils and window details. The interior walls are covered with white tiles that were sourced to match the 40-year-old ones that clad the exterior of the building. Windows shaped as diamonds and octagons are arranged in rows across the doors like chocolates laid out in a tray. Dezeen filmed an interview with Jaime Hayón during the 2010 London Design Festival - watch it here. Papabubble the artisan candy shop in Yokohama was designed by Japanese designer Yusuke Seki collaboration with Jaime Hayon. Papabubble - Caramels Artesans started in Barcelona in 2004, and has since launched all over the world. The candies are all hand made, and shows the process of making candy for a customer, and in doing so, entertaining kids and adult viewers alike. The shop design resembles a laboratory, and shows off the finely presented handmade look of these experimental candies. Yokohama brunch is the third shop in Japan. The difference between this shop and most others is that it is especially design focused. Up until now, Papabubble shop has been a designed based on a laboratory style. However, this latest store was designed by Yusuke Seki with Jaime Hayon, and you can trace their strong and unique design values in the fine decorative details of the work. The location is an office area in Yokohama - a bay nearby Tokyo - and the store was lacerated street level of a building which was built about forty years ago, which meant Seki needed to embark upon extensive renovation to the building. In emphasizing the new aspects of this design, Seki managed to create a strong correlation between INSIDE / OUTSIDE method. Not only designing focus on interior design as physical territory of place to illuminate, but also Yusuke was integrate all relevant material such as location, architecture skin, time. Using same element retrospectively, Yusuke create explore and cross over time scale but also interior wall are being part of facade and continually. For the purposes of continuity, Seki found and used the same tile material which was use on out side wall forty year ago.This helps the outside wall for the interior wall, helping to ensure the authentic facade of the original building. Because Seki's space are seems simplicity and design focus on presence of space, Jaime took on the challenge of decorating the space in a way that added a stronger sense of character and identity. Ordinarily, Papabubble stores use laboratory tools to demonstrate the experimental process of making candy, but on this occasion Jaime design these tools deliberately with more personality and defined detail such as windows, utensils. Bottles are designed by Jaime, was inspired from the performance of candy by artisans. Especially the bottles are normally icon of Papabubble store, but this time, these are one-off original made by Massimo Lunardon from venice. These stunning crystal glasses are coloured by range type of liquid, this made the difference of design from other Papabubble brunch in all over the world.